Summary: 16-year-old Billie (Tilda Cobham-Hervey) finds the path to independence accelerated when her mother (Del Herbert-Jane) reveals plans for gender transition. Once it is decided that she should live with her father (Beau Travis Williams) and that her time with her mother will be limited to once a week on Tuesday afternoon, Billie devises a creative outlet that causes her to form a close bond with two fellow students at her school (Sam Althuizen, Imogen Archer). Occasionally a debut film comes along from a director that really makes a big impact. New Australian film 52 Tuesdays is one such film, it is therefore no surprise that this film has already picked up awards at Sundance and Berlin. You may here that the way the film is presented is experimental, that is true but that certainly doesn’t damage a film that deserves to be regarded as one of the better films of 2014. Split into 52 segments the film shows what happens when 16-year-old Billie (Tilda Cobham-Hervey) suddenly learns that her mother, James (Del Herbert-Jane) is about to undergo a transgender transformation. Firstly Billie is told that James wishes for her to go and live with her father, Tom (Beau Travis Williams) during the process, although he/she is open to seeing Billie every Tuesday for a few hours. The 52 segments are what happens on each of those Tuesdays and not only explore the relationships between Billie, James and Tom but also show Billie’s time with her bi-sexual Uncle Harry (Mario Spate) and her sexual experimentation with her close friends Jasmine (Imogen Archer) and Josh (Sam Althuizen). Director, Sophie Hyde really needs to be congratulated for the brave decisions that she has made with this film. First off the all the whole segments idea is something that could have really brought this film unstuck. But the film’s plot is so interesting that instead of the audience using the segments to count down to the film’s finale they actually find themselves wondering how the film can possibly close with so few segments left. Yes this experimental idea works so well that it is one of the reasons that this film becomes so special. The film also takes the brave step of showing exactly what someone goes through when they are attempting a transgender transformation and to the film’s credit it makes this storyline emotional and engrossing without making those people looking in from the outside also being made feel guilty. The story around Billie’s sexual experimentation is also risky but done tastefully, fully showing the consequences, and it is that side of the film that really reveals Hyde has one of the most brave directors going around since Larry Clarke when he shocked the world with Kids. What also makes this film work so well is the performances of its cast, many of which are first time actors. Del Herbert-Jane plays the role of James so well that there is little doubt that if 52 Tuesdays was an American film the Oscar nomination praise would already be coming in. Then there is young Tilda Cobham-Hervey who like Hyde uses this film to announce to the world just how talented she really is. Like how Abbie Cornish did with Somersault, Cobham-Hervey really puts in a brilliant performance with 52 Tuesdays. She is an instant reminder of Mia Wasikowski and it is little wonder why on the back of her performances here she was asked to audition for the new Star Wars film. 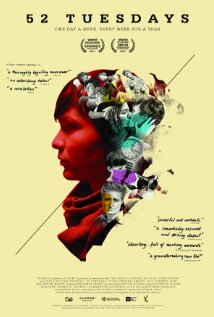 52 Tuesdays is a wonderfully written drama, that errs on the side of experimental but comes across as a strong piece of cinema that is certainly worth paying to see. An amazing film from a talented debut director. Other Subculture Media Reviews of ‘52 Tuesdays′: For our complete 52 Tuesdays review please check The Good The Bad The Ugly Film Show Ep #77. You can also check out a further 52 Tuesdays review by Dave Griffiths that was given on First On Film on J-Air on the 4th May, 2014 here.